Practically this is not normal for standard induction motors to operate at these high frequencies due to their design. In practice a command frequency set point of between 25 Hz and 75 Hz is acceptable without compromising performance or introducing any mechanical damage to the motor. 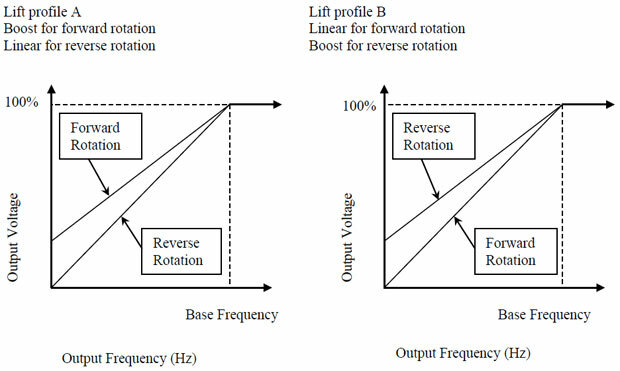 At low frequency set points, care must be taken that there is enough cooling produced by the mechanical fan for the motor. At High frequency set points mechanical failure may occur due to the mechanical design of the motor bearings normally rated at the design speeds of 2, 4, or 6 poles. At high frequency command speeds, care should be taken as torque loss may be experienced. Basic torque control is possible in an open loop system; however, the actual system response required must be considered. In an open loop system the frequency inverter monitors the motor current and adjusts the voltage to perform torque control, depending on the installation, if the current of the motor does not vary sufficiently very inaccurate results will be obtained. With the aid of an optional interface card most frequency inverters have the ability to be used as a low cost position controller. Items to be taken into consideration are the dynamic response of the motor and control system. As a rule of thumb an open loop system with standard squirrel cage induction motor is approximately 400 radians /second, in a closed loop system with a standard squirrel cage induction motor and feedback approximately 600 radians /second. A full servo system is approximately 1000 radians / second. 1 radian / second = 9.55 rpm or 2π radians (rad.) in 360° or 1 radian = 57.3 °. A Simple adjustment of the time required to accelerate the motor from rest to full speed (Starting), normally 50 Hz and from full speed to rest (Stopping), ensures a smooth controllable start and stop sequence. This reduces mechanical wear on the machine. 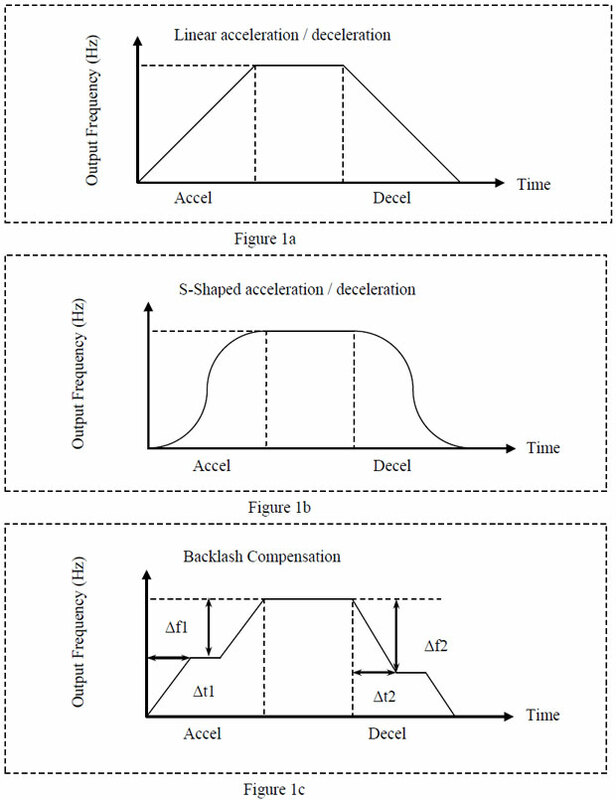 Various types of starting and stopping curves are available by setting the correct parameters in the frequency inverter as illustrated in figure 1a to c.
We all know that a Direct On Line (DOL) starter will supply full voltage to the motor at the supply frequency with the current uncontrollable. The motor will use as much current as the load requires normally between 600 to 700% of the full load current of the motor. Before the days of Soft Starters and frequency inverters, our alternative to control the starting current was with Star Delta starters, which reduced the starting current to approximately 200%. Our next best device today to limit the starting current is to fit a Soft Starter, With Soft Starters we use the Phase Angle principal to control the voltage and therefore reduce the starting current while at the same time producing a smooth controllable start. The limitation is that these units are very basic and have limited adjustable time settings, normally from 0 to 60 Seconds. The current limiting features on frequency inverters ensure that when you accelerate a motor from rest, you will not exceed more than 100% of the Full Load Current of the motor. By replacing DOL starters with frequency inverters will reduce the Current Demand when starting motors. Frequency inverters will deliver maximum torque at the motor shaft while limiting the current to the Full Load Current setting of the motor in the frequency inverter. It is the responsibility of every individual to use forms of energy, effectively and efficiently. It is already well known in the Heating and Ventilation industry that volumes, flows and pressures of centrifugal fans, pumps and compressors can be controlled by mechanical means to match the demands of the system, many of them do not consider the immense amount of energy, hence watts, hence money that can be saved by using modern reliable electronic technology. If the efficiency of the system can be improved the power demand drops proportionally with the increased efficiency. Almost all fans, pumps and compressors are over kilowatt powered (just in case) and seldom do they work at their maximum designed efficiency point. Fitting an Inverter to a fan, pump or compressor motor varies the motor speed which then varies the characteristics of the fan, pump or compressor to operate at a different efficiency to produce massive energy savings. Because of the Affinity Laws, which say that: Flow is proportional to Speed and Kilowatt varies as the cube of the speed. The flexibility to set-up and configure a frequency inverter for various applications i.e. : Constant torque, Variable torque, Hoisting and many others, allow users to customise units to suite their needs. See illustrations in figures 2 and 3. Most frequency inverters are supplied with basic LCD or LED Display keypads, with which the user can adjust the inverter parameters such as acceleration time, deceleration time, Full load current, etc. This allows the user to customise the Inverter for his application. Most frequency inverters have advanced units that could copy parameters from one unit to another. Apart from this basic function most units available today are supplied with serial communication ports to interface with personal computers and allows users to analyse the behavior of their system. Our demanding society forces Management to know what is happening in their plant and process. Information from frequency inverters is not only for the Engineers benefit, but also allows management to see if they could increase their production safely by not overloading the process or plant. This is normally done via the serial interface. It is also possible to integrate units into a complex network system. It is to the advantage of the users that where mechanical wear is part of the process, users could speed up or slow down their application to deliver the necessary production by frequency inverters. In a case study done it was found that due to excessive wear, the life of a pump was approximately six months. A frequency inverter was fitted to regulate the flow, as the flow reduced due to impeller wear. This enabled the user to increase the speed of the pump to produce the required flow, increasing the life of the pump from six months to twelve months. The other benefit was that when the pump was still new the speed could be reduced according to the necessary flow required, saving energy and decreasing the wear on the impeller.